240 p., 8 ill., 14,7 x 20,8 cm. Following the work of Eickhoff (1988) and O’Shaughnessy (1998), the ›Yearbook of Psychoanalyses 74‹ on the theme Lie is dedicated to a relational dimension which has been widely neglected in the psychoanalytic tradition until now. This may be due to the fact that it was seen more as a contraindication to treatment. However, the underlying view that the liar is someone who is supposed to know what the truth is (Philipps in Forrester 1997) cannot be maintained. For, as occasionally someone who thinks to tell the truth is basically lying, it might as well be the case that someone who lies consciously, unconsciously tells the truth. So, how can we understand the problem of lying more precisely from the point of view of psychoanalysis? And, what role does lying play in psychoanalytic work? The author shows that the novelty of the solution, which brings forward psychoanalysis against the threats of lie and deception, is that it transcends the dialectic of faith and deception. The fact that Freud dropped the either/or of constitution versus trauma and fantasy versus reality, led to a revival of the question of the significance of mendacious or true statements. Even though Freud was a passionate defender of honesty, he also held the opinion that repression is a kind of self-deception. However, lying is the negative starting point which had to be left aside so that psychoanalysis could exist. That is why the desire for the other side of lying, a longing for truth, is constitutive of psychoanalysis. However, at the same time, psychoanalysis, according to Lacan, always operates in the dimension of lies. The analyst should be allowed to keep a space open in which threats, fantasies and lies can turn into language, without automatically triggering an alarm in those who are named as potential victims. The contribution begins by sketching out the development from functionality to morality of truth and lies in human history. From a psychoanalytic view, lies rank among the forms of defense. Together with shame, they act to prevent humans from recognizing truths about themselves. A case vignette exemplifies this point: In a dream, Jesus encounters a man and asks him, »Do you love me?«. Against his better judgment, the dreamer responds »yes«, and at this very moment he knows that he is doomed. The analyst at first searches within himself for the resonance of the external dream experience. Then in the subsequent joint dream analysis, the focus rests on the various representatives of the Ego in the dream scene. It reveals that the lie uttered in the dream corresponds to a denial in the dreamer’s life, one which distorts his relationship to a closely related person. Reading Kafka without considering his diaries is like interpreting a dream without the associations of the dreamer. Many entries in the diary are directly concerned with literary productions. The Trial deals with an archaic, religiously founded, depressive guilt and shame, feelings that are even not solved or atoned by death and thus result in conscious or unconscious gap in the character, deriving from undigested beta-elements (Bion 1963) and are therefore not comprehended and concretely denoted. This state of mind can result from early traumatisation as the effect of unresolved desillusion in early childhood which may provoke extreme affects of hate that are not contained and worked through by ›good enough mothering‹. The unbearable affects result in an internalised false representation of the self and the other. The internalised ›bad mother‹ is incapable of empathy and true understanding of strong affects, which leads to a splitting of good and bad objects and ambivalence and depressive feelings that would normally be contained in confiding and trusting relationship, which may include both love and hate. The result is hate against the human family (Kafka), hate of oneself, of mankind and life. Strong feelings of guilt repress the underlying repressed shame (Lansky 2007) due to the early fundamental illusion of the baby which believes that the breast belongs to the self, not to the mother. Powerless rage and unconscious feelings of hate and revenge destroy the capacity to enjoy the company of one’s fellow men and of life beyond the omnipotent paradise. Instead of concrete gratifications of instinctual impulses there are regressive states of mind and destructive retreats into phantasy. Critical awareness of the self and the other is suppressed, leading to submissiveness and shame. The self gives up independence and selfconfidence to answer fundamental and authentic questions about his life. He becomes an easy victim for seduction from fundamental seducers promising liberation from unbearable guilt and shame feelings in heaven through sacrifice of life. It is said that lies do not travel far, but this is valid for those lies only which are recognized. In fact, untruthfulness is part of everyday life. Although regarding primates, we know deception maneuvers, with the result of advantages for those who mislead others. Lying does not seem to be exterminated. Many people feel veneration for clever fraudsters because they seem to overcome the reality principle and to satisfy unconscious phantasmal delusions of grandeur. Deception is very close to self-deception. There is a massive destructive potential in falsehood, because it may destroy trustful relationships in partnership, family, common relations and even society. We know this from the attachment theory. Although men will never live without lying, everyone is responsible for handling his own aptitude of lying with responsibility. The essay deals with the paradoxical terms of the absoluteness of lying: »I never lie« and »I always lie«. The paradoxical structure of lying becomes particularly clear in patients who are either convinced that they are not lying, or who follow an inner constraint and are always lying to themselves as well as to others. A short case vignette shows how this kind of lying creates a relationship through which the person concerned tries to get out of an inner predicament or a relationship trap and rescue a threatened relationship. This, however, is only possible at the price of a destructive attack on the relationship concerned. Like the excuse, the paradoxical lie tries to get out of emotional distress, but the liar, since he already seems to hold the truth, is no longer able to discover it in the sense of a third position. Thus, he brings the relationship to a collapse. Instead of gaining the hoped for extra freedom through lying, the liar ends up in a psychotic situation which, as a result of the omnipotence of its imagined truthfulness and the consequent split and separation from the object, proves to be a perversion of thought. The author describes the beginning of the treatment with a seven years old girl who had suffered early loss and disruption of relationships. It is shown how these experiences reflect themselves in her relationship with the analyst. The girl’s emotional reserve is seen as her way of saying »no« not to get into too close a contact with the analyst. It is shown how discontinuity of early life is reflecting itself in the patient’s tendency of partially retreating from her analyst and in the danger of breaking off the treatment. This way of interaction is connected to Freud’s concept of »negation« at René Spitz’s »no and yes«. Negation is seen as a possibility of the patient to protect herself against catastrophic fear and emotional states of her early life. The patient’s capability of communicating symbolically on different levels is described: verbal way of communicating her »no« to the analyst and aspects of »primary symbolization « (Roussillon). The text is ending with some technical considerations. Joachim F. Danckwardt: »Er persönlich gibt alles gesagte preis«. Buchessay zu Ulrike May: ›Freud bei der Arbeit‹. The paper sketches the main access route to psychoanalytic data and the association attention dialectic, its origin and the background of the new model of research and science with its radical reconceptualization of perception, attention, memory, interest and desire. 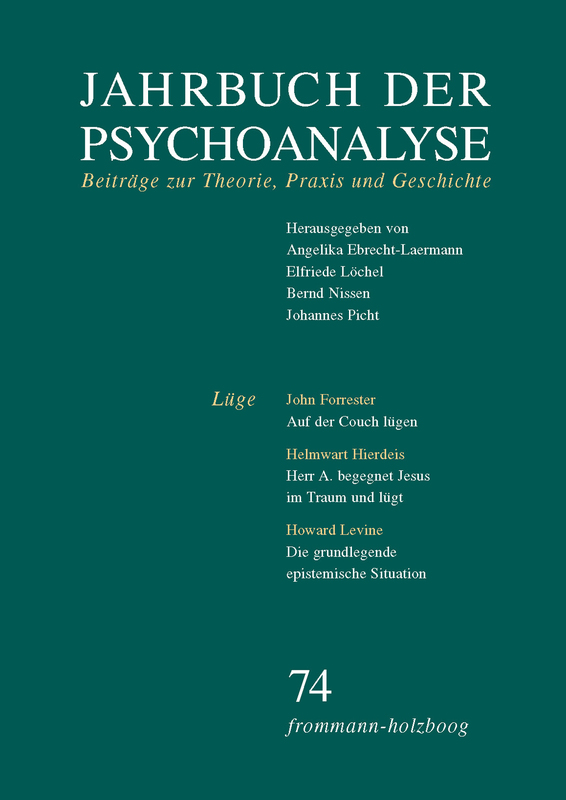 Against the background of the renunciation of the antecedent methodological objectivism, it focuses on the fact that Ulrike May has applied the new method on the emergence of the original texts of early psychoanalytic research between 1908 und 1920 and on the production of early psychoanalytic theory. Using this process, she has discovered the possible structure of scientific revolution in psychoanalysis in a very short time: psychoanalytic science as a cooperative practice and collective interest, on the one hand, and the subjects of the research, on the other. May can make clear the dependence of the theory of the nature of data collection and data extraction. The new insights consequently developed are carried out: The beginnings of narcissism, the theories of depression, the developmental history of libido, the contexts of the theories of the ego, the psychoanalytic etiology formulas regarding male homosexuality, the beginnings of gender research and the beginnings of research into aggressive-destructive responsiveness.